Handsome Beer Company has had several DC area events and Baltimore events with more to come. There have been reviews and interviews done by Fritz Hahn and DC Beer as well as I am sure others. I don't want to recreate or even attempt to copy what that high of caliber of beer writers have done, but thought I would jump in. I will say surprisingly enough my favorite is what they did with their Medium & Message. I am usually a malty mama, but the Medium & Message was really intriguing. There was some interesting fruit notes and some bite in the form of pepper that came through. If you haven't checked them out - do. They have an event coming up on Friday. These are two amazing fellas who are really passionate about what they do. They are perfectly executing some great styles of beer. I really imagine considering the quality and they're energy, we will be seeing them on the scene for a while. Which in the long run is great. I don't think we have hit capacity yet in the DC area in regards to beer. This...excites me and it should you. There's plenty of opportunity in the congenial bunch (who sometimes pretend to be curmudgeons) for healthy competition. I think that will continue to make it a fun and engaging scene for guest/consumer to brewer. So to that I say, enjoy Handsome Beer and encourage more innvators to bring their A- game. 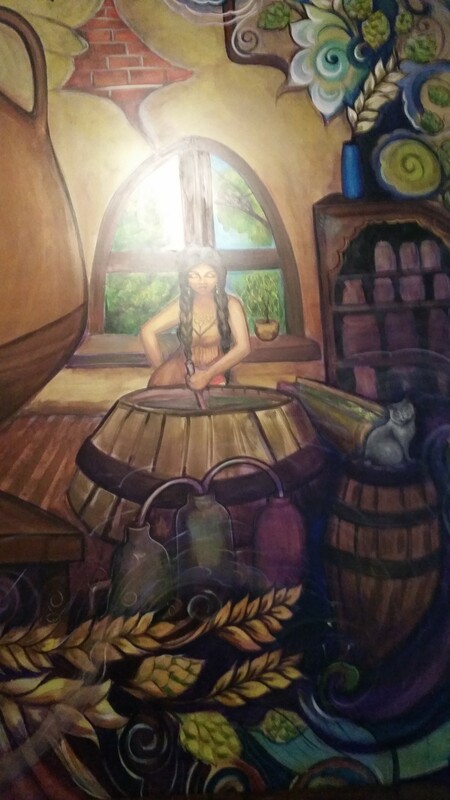 During this last trip home to South Florida, I was able to visit Wynwood Brewing Company. I have been wanting to visit ever since they began welcoming guests. I convinced my mom to drive me (shut up, I don't have a car while I am there) and off we went. 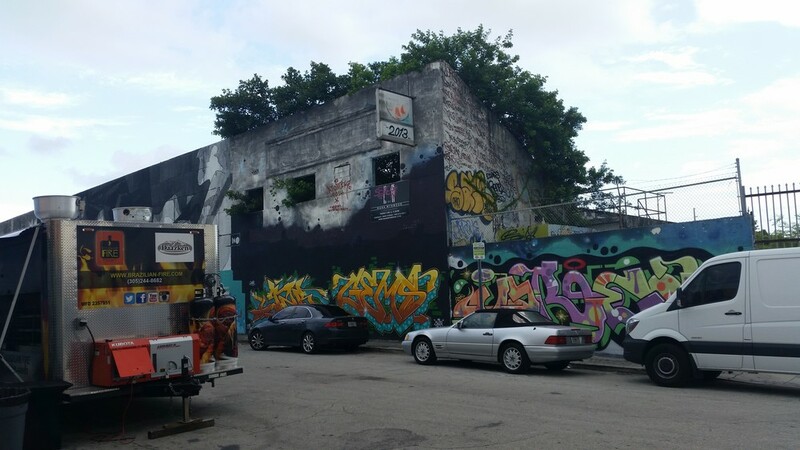 Wynwood portion of Miami is an arts area that has blown up over the last few years. Previously, it was mostly warehouses. It's amazing to see what's been done. Although there are some concerns about the driving cost and what it will do to some of the local merchants and artists. 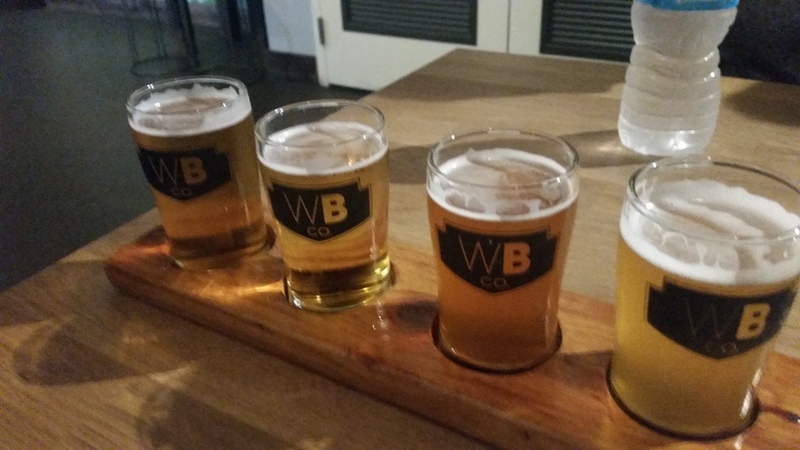 Wynwood Brewing is a real great addition to the burgeoning Florida brewing scene and Miami in general. It was founded by a father and son team and is definitely a family affair. I first became interested in what they were doing when I saw the Miami Herald article about their opening. Being the first brewery to open made them trailblazers that had to deal with a good deal of red tape and absurdity. They overcame that and even found a novel way to fundraise in securing a government loan to open their business. I hadn't heard about many other breweries taking advantage of that in the past. 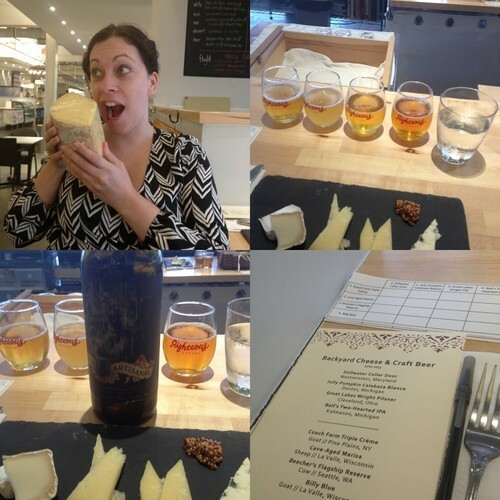 After entering the tasting room, I ordered a flight that included their signature beer La Rubia. La Rubia is a blonde ale made with a combination of German Pilsner Malts, British Crystal Malts, Czech Saaz Hops and German Ale Yeast. It's incredibly refreshing with mild bitterness that leads to a smooth finish. I also checked out the Magic City, Father Francisco and Rickenbacker. Magic City is a great example of a pale ale. Father Francisco was light in body with some spicy and sweet notes. Rickenbacker was more of a session beer done in the pilsner style. It was light bodied with citrus elements on the finish. 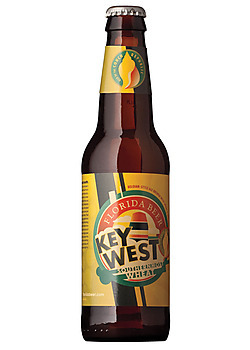 All the beers reference Miami in some way as in historical elements or geographically. 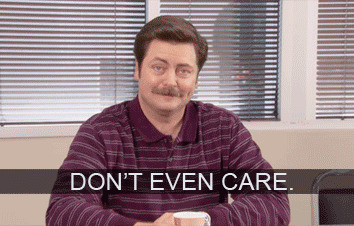 One thing that stayed with me after the tasting and tour was the "Miami water makes Miami beer" comment. Water is definitely a crucial element of beer, but how crucial? I am clearly a novice in this, but still I would love to read more and hear other thoughts by more knowledgeable people about the water question. In the end, I would highly recommend visiting Wynwood Brewing and the area in general. 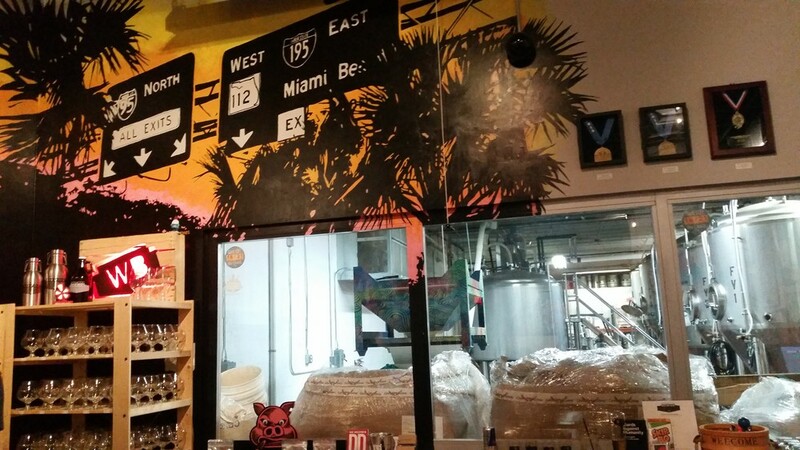 If Wynwood Brewing is any indication on what Miami can do, expect big things. 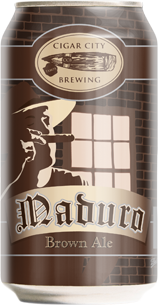 There's a new beer that is about to blow up in the Washington, DC area. I was lucky enough to try their first release. They started with something simple, but pure. We all discussed their interest in starting lager. There's no barrel aging, there's no added flavors to complicate things. It proves that these fellas know their game. As one taster said, being able to create something so simple and so good is hard. It was balanced and smooth. It was incredibly refreshing with light citrus elements. In my mind the three founders live in a loft, get into hijinks while taking care of their beer baby. The three founders all have great palates and experience in industry and homebrewing. I talked to one of the founders who mentioned the amount of accounts already secured and I was amazed. Expect to see big things from these fellas. You should be seeing them on beer menus in the area soon. Try it and expect to be impressed. 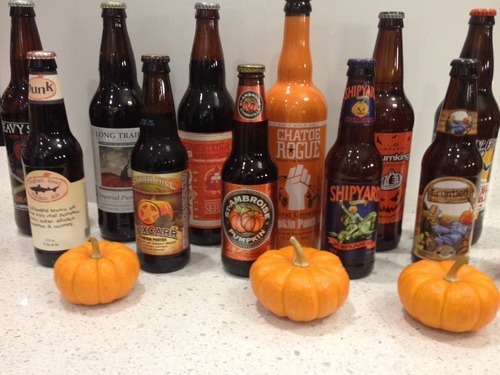 The great folks at DC Beer keep us updated on all things related to beer in the DC area. They recently posted an article on their coverage of the Craft Brewer’s Conference that will soon be descending upon DC. I am already planning out my week including many trips to Smith Commons for their Masters of the Craft Beer Universe events. Which events are you planning to attend? Did somebody say beer dinner? I have great respect for DC Brau. The founders are hard working and passionate men. I remember after they first opened, I tried to find The Public Ale. It was amazing having that first beer. 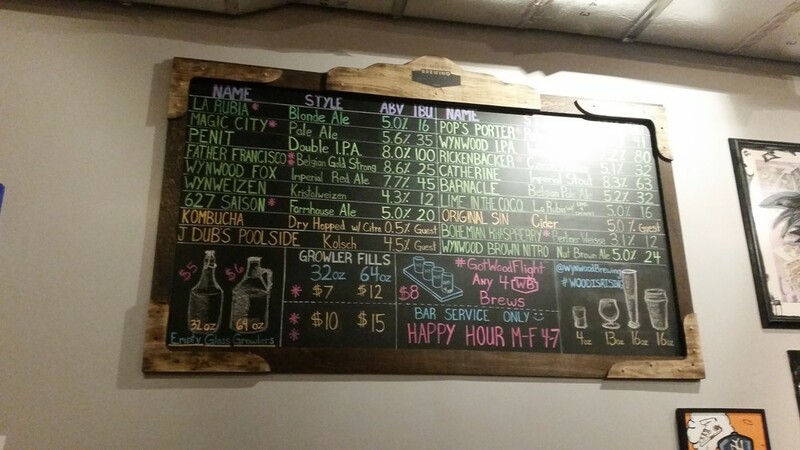 I had a friend at the time who had just moved to San Fransisco and took photos of DC Brau. He eventually made his way back home and loves DC Brau. 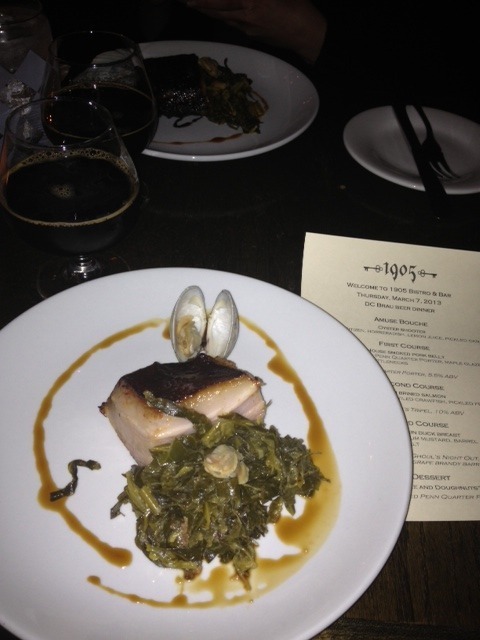 This past Thursday DC Brau held a beer dinner at 1905. The event was featured on TasteDC’s calendar among other great sites. Before the dinner, they held a release happy hour for their Saint Joseph’s Tripel. The beer is named in honor of Joey Belcher. They also donated a portion of the proceeds of the happy hour as well as remembered him fondly during the dinner. I missed the happy hour as I was catching up with a friend at Vinoteca. It’s another great spot in the area that never gets too packed for weekday happy hour and offers several wines by the glass for $5. I showed up shortly before the start of dinner. I was greeted by the wonderful staff of 1905 including one of my favorite bartenders, Lyn. She’s a sassy lady with amazing taste in beer and food. 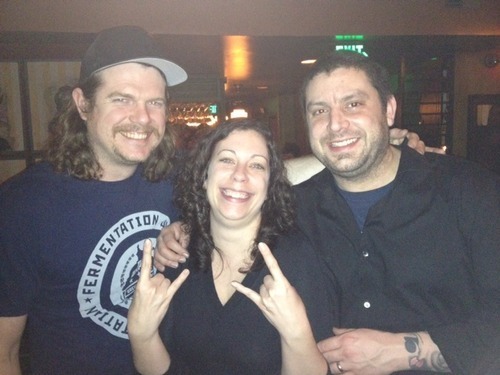 I also was lucky enough to meet one of the DC Beers crew, John Fleury. Let’s get started with this tasty dinner. Nom nom nom. 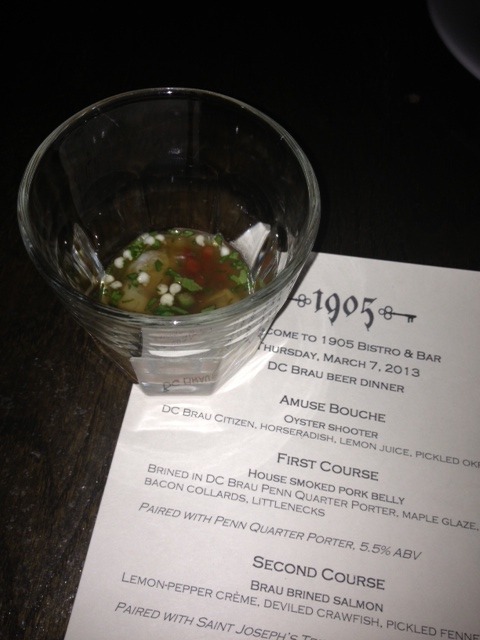 The amuse bouche featured the DC Brau Citizen as an oyster shooter. I am not the biggest fan usually of oysters, but the spice and acid notes were perfect. 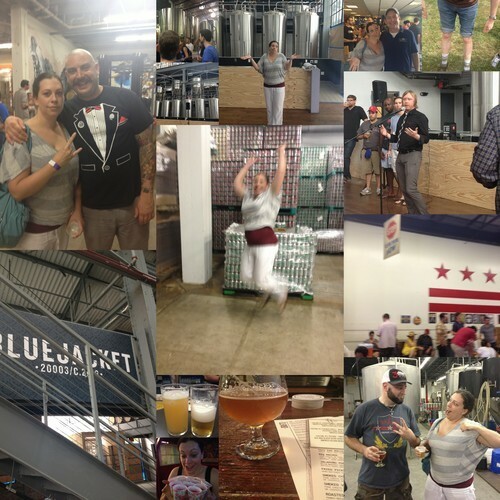 The DC Brau Citizen had a balancing effect. My preferred beers are stouts or porters. I love the Penn Quarter Porter. The pork belly was succulent. It was so creamy along with the beer it came out very luxurious. The collard greens with bacon added an element of salt. There were amazing chocolate notes in the porter with some smoke towards the finish. This was yet another amazing dish. 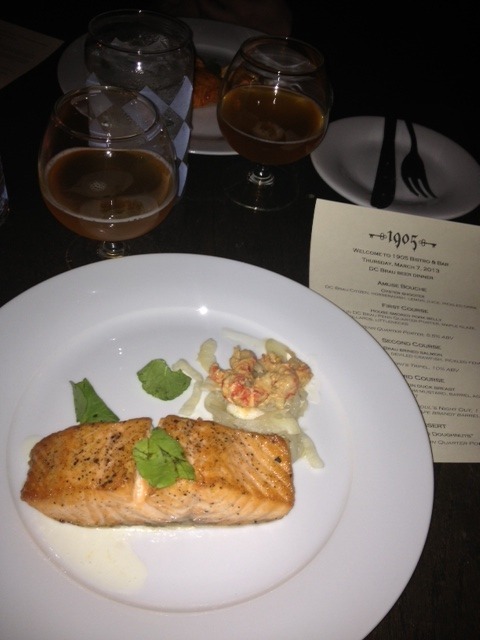 The tripel made delicious sense with the salmon. As Jeff presented the dish, he spoke of having beer compliment or contradict your food. It’s a great aspect of dining with beer. The salmon was cooked perfectly. It was incredibly moist and sort of fell apart in my mouth. The deviled crawfish and pickled fennel added a nice sourness that was a palate cleanser. The tripel was a great homage to the Belgian tripel. It wasn’t as overpowering as I find Belgian tripels (possibly food would help). It had lovely citrus notes, some toast and mild sweetness. Next we moved onto the duck, which to quote my man friend was “quacktastic”. The sorghum mustard added spicy notes combined with the barrel aged ghoul’s night our beer salt and beer itself. 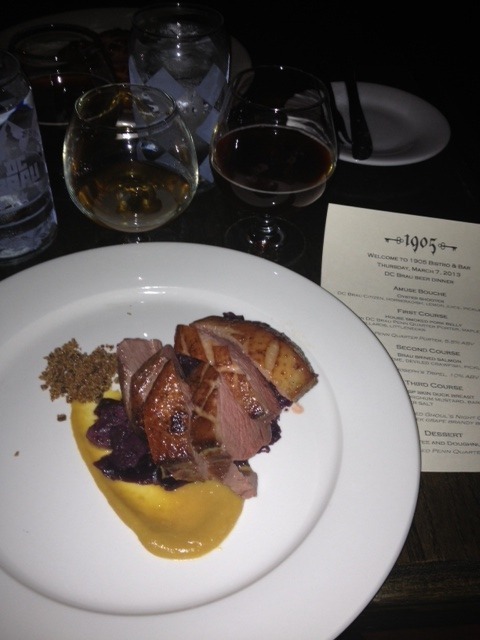 The beer had amazing caramel notes that brought out additional flavor in the duck. Even though I prefer heavier beers, this may have been my favorite. It reminded me somewhat of a doppelbock with caramel flavors and a lovely smoothness. We also had the opportunity to sample the Catoctin Creek Brandy to have a better understanding of how the beer was aged. This may be my new favorite brandy. It was very smooth with great vanilla notes and hints of molasses. Obviously, I love donuts. I went to the donut party. One can never have enough donuts. 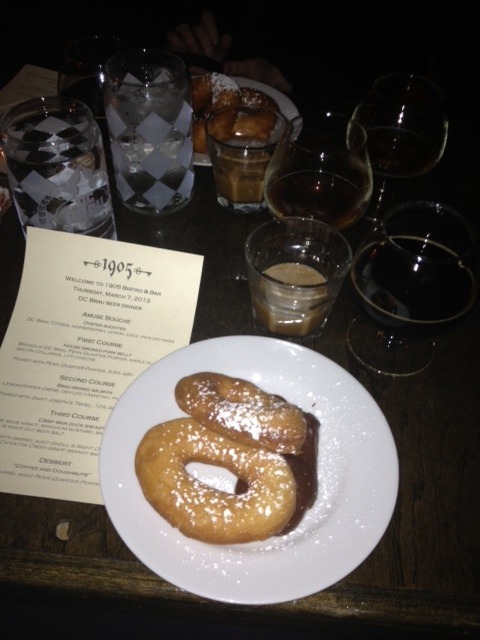 As we finished our dinner, we were treated to donuts with light powdered sugar, chocolate ganche sauce, Barrel Aged Penn Quarter Porter and a coffee styled chaser. The donuts were light, fluffy and warm. That’s a key to donuts is conning the mouth into thinking they are eating something that hasn’t been fried in grease. At least, that’s what I tell myself. The barrel aging added more vanilla and toasty notes with hints of whiskey to the beer. It rounded the finish. This was an amazing dinner with great people both attending and working the event. I always love my visits to 1905 and hope to go back soon. Oh and DC Brau! I’m calling you out. Have more beer dinners! !